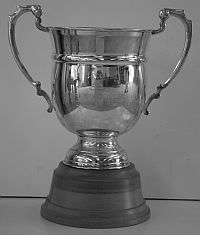 Awarded at Maadi (National Champs) since 2007 to the winner of the Boys under-17 double, the Cup is currently held by Whakatane High School [WHAK]. The Whakatane High School crew won the event in 2013 by about 1.75 lengths from Waimea College [race results]. Full event results are available for: 2007, 2008, 2009, 2010, 2011, 2012, 2013. Donated by St Andrews College to mark the long involvement of the school with rowing and also for the support the Rector of St Andrews College, Harvey Rees-Thomas, has given to rowing at the school.